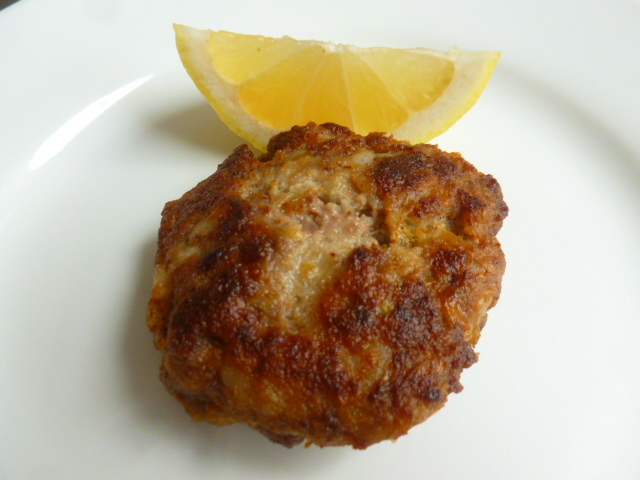 Leeks and potatoes patties are a favorite of mine, and I make them often, when leeks are in season (click HERE for the recipe). So when I’ve found nice leeks at the store, I was planning on making them again. Then I recalled the version to which beef is added, and decided to make it instead. However, it turned out that the amount of meat I had was more than the original recipe called for. 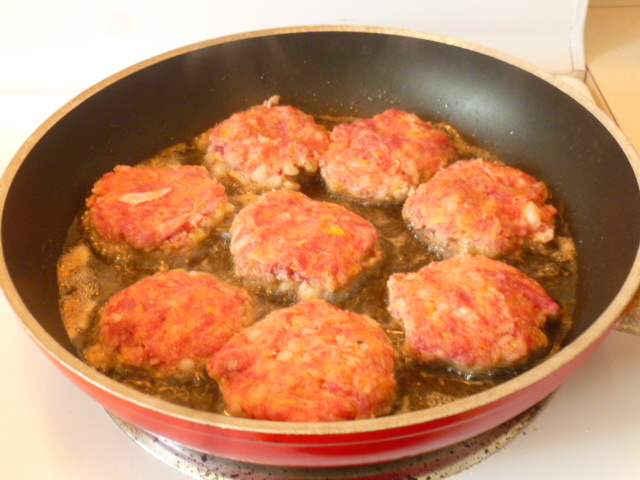 I could choose to keep some of the meat for other uses, but after a thought, I decided to use it all, and make the beef the major ingredient of the patties. The patties came out very tasty: the leeks added their subtle oniony sweetness to the beef, and the potatoes added a smooth yet rustic texture. 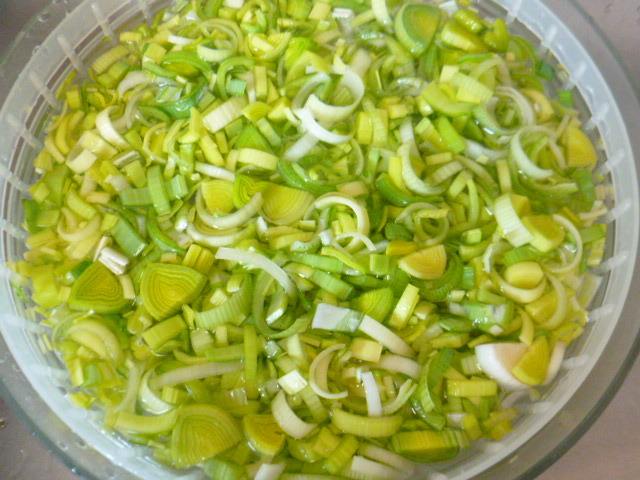 I will no doubt make this version again soon, as the leeks are now fresh and plump. Try it and enjoy. * As with any ground meat, I recommend grinding it at home. This way you have full control over the freshness and type of meat you’re using. 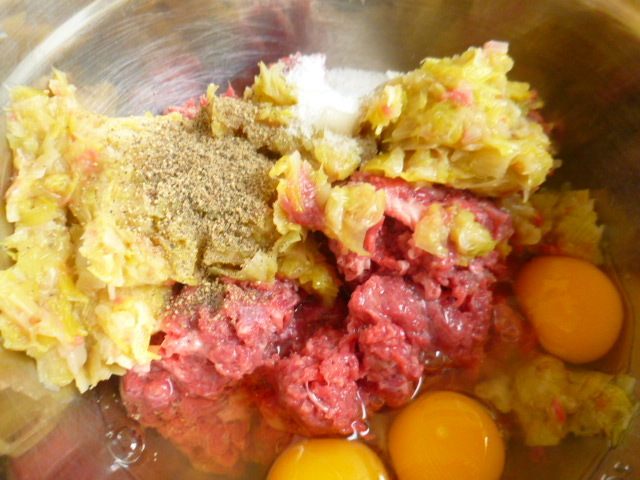 * If you prefer smoother texture, grind the meat in a meat grinder instead of chopping it in a food processor, as I’ve done here. 1. Place the potatoes in a medium pot, cover with water and cook for about 25 minutes, or until soft. Drain the water and let cool to room temperature. Peel and coarsely mash with a potato masher. 2. 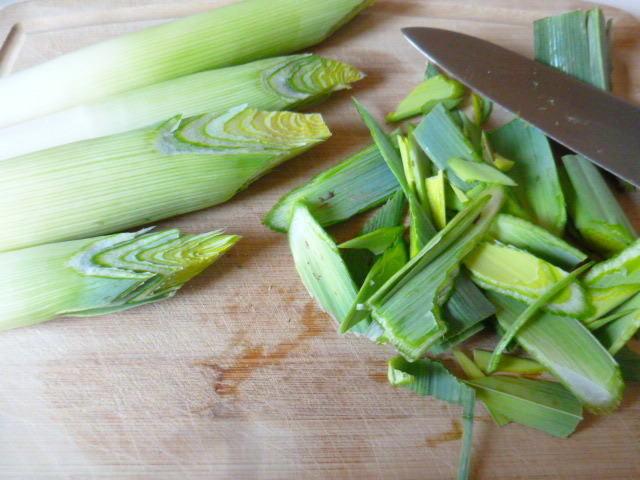 Prepare the leeks: cut off the dark part (wash and keep for stock), and the root end. 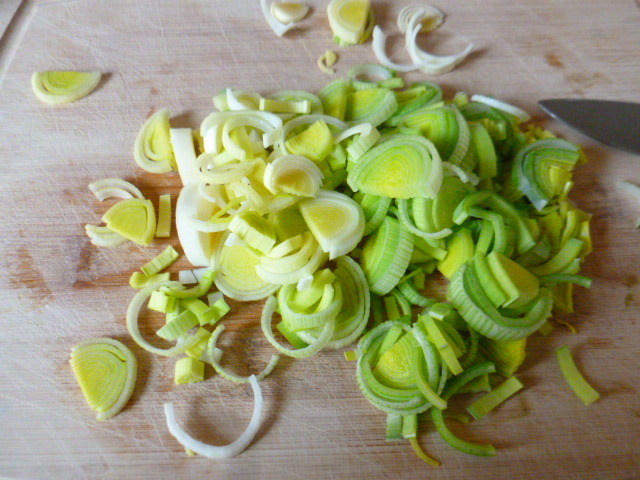 Cut the leeks lengthwise and slice. Place in a bowl with a colander and cover with plenty of water. Mix well, so that the dirt will sink to the bottom. Lift the strainer, get rid of the dirty water and repeat the process until the leeks are clean. Drain and place in a wide pot. Add ½ tsp salt and just enough water to cover. Cover the pot and bring to a boil on medium-high heat. Lower the heat to medium and cook for 5 minutes. 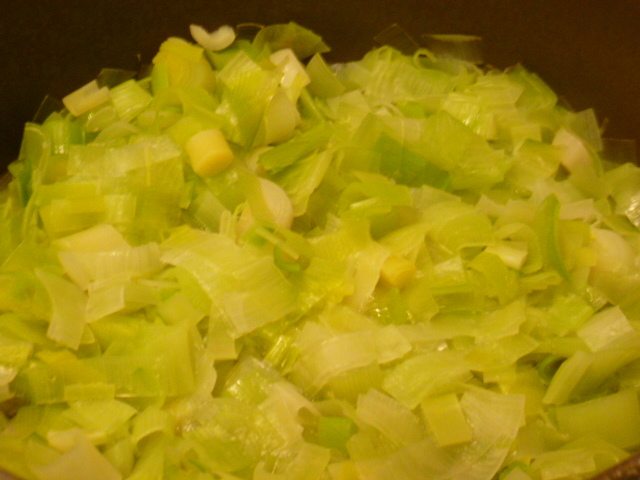 Uncover and keep cooking for 3-4 minutes more, until the leeks are soft and the water evaporated. Cool to room temperature. 3. 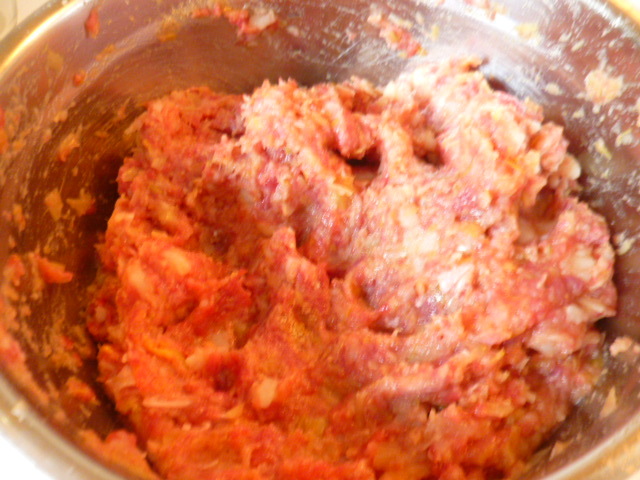 Chop the meat in a food processor. Transfer into a large bowl. 4. 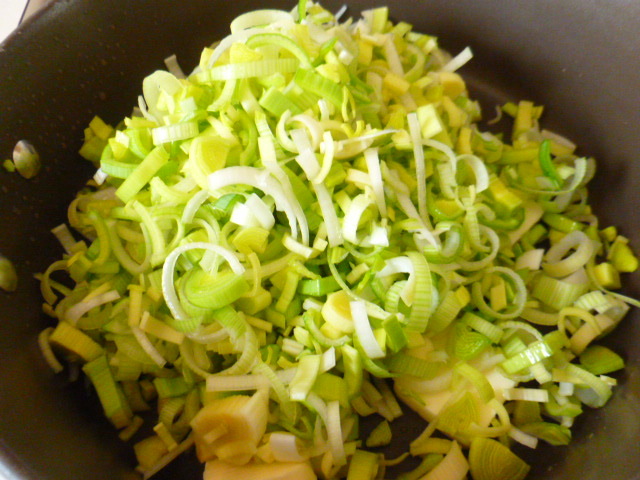 Add the cooked leeks, eggs, salt and pepper and mix well. 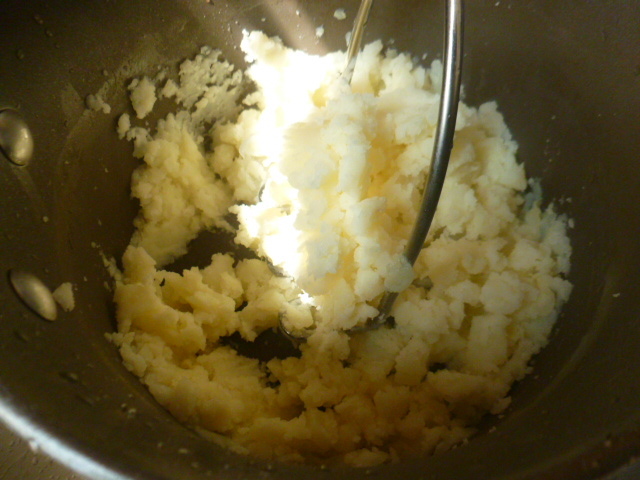 Add the mashed potatoes and bread crumbs and mix briefly, so that the potatoes will still keep their coarse texture. 5. Heat oil in a wide pan over medium-high heat. 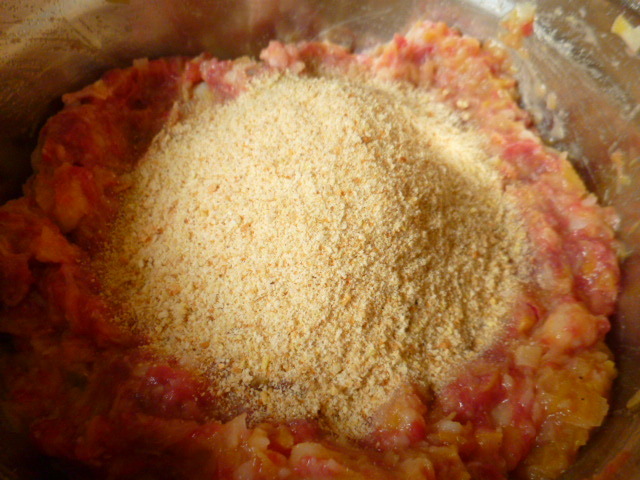 Take ¼ cup of the mixtures and form into a fairly flat patty. Fry for about 3-4 minutes on each side, until the patties are golden brown. Place over paper towels, to absorb extra oil. Serve warm, with lemon wedges, or with roasted cherry tomatoes and peppers sauce (click HERE for recipe). I’ve mixed burger meat and hot Italian sausage together, or added in chopped onions, or different herbs, for NOLA Boy’s cheeseburgers occasionally, but this looks even better. The patties look wonderful. I never would have thought of using potatoes as part of the filler in a recipe like this. Great recipe, Ronit! I will make these for Chanukkah. I usually make several different kinds of latkes for Chanukkah, all vegetarian, but at some point you also have to have a Seuda, which means a fish course and a meat course. 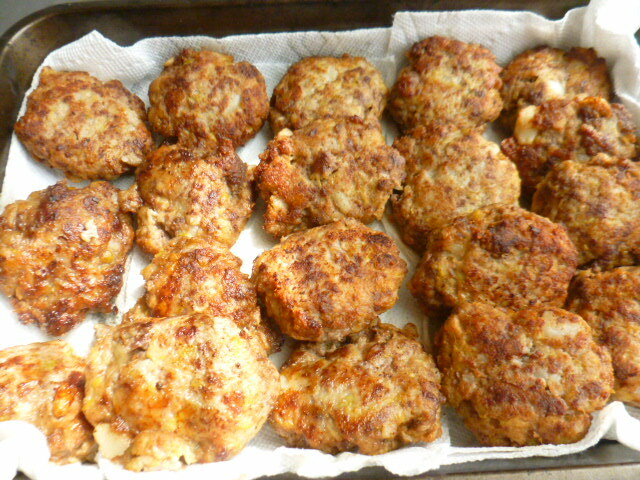 I usually make either stuffed cabbage or Russian hamburgers, but your recipe is a terrific way to combine potato latkes with meat, as a main course. I have you to thank for it! Your patties look good to me – I was thinking what a good hamburger it might make as I add onions to my beef but potatoes would give it a different texture. 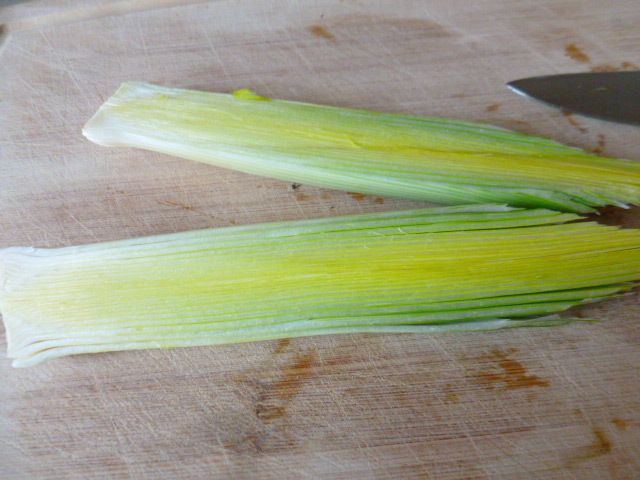 I wish I still grew my own leeks as they seem to be so expensive at the market. Thank you Judi, I’m glad you liked the recipe. I think the patties can work well as hamburger fillers, though I didn’t try it yet. 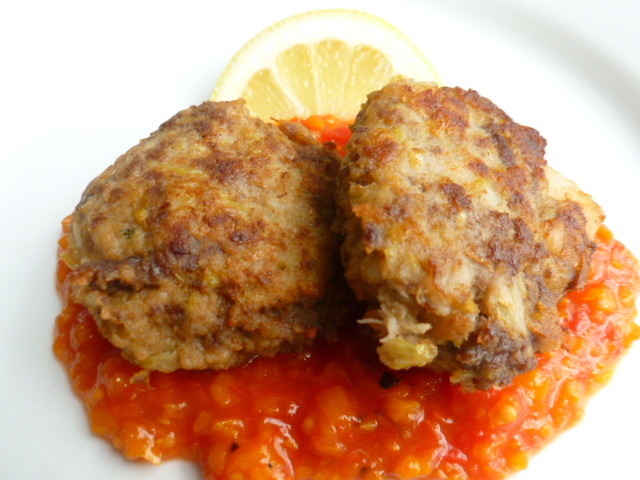 Yummm, they remind me of the ground beef cutlets I grew up on. Like the idea of leeks incorporated and of course the potato. This does sound like it would be very good Ronit, I can see why you will be making the beef, leeks and potato patties again. The sauce sounds like a nice accompaniment too. Are these British? Or just something you threw together once and loved? They really sound tasty, and would make fun appetizers! I often pair leek and potato Ronit – but too often I take the easy option of soup. So this recipe really appeals! Meat patties are a weekly thing here, so your leeks and potatoes patties would set proudly on our table. I like the idea of serving them on a fresh tomato sauce. A good loaf of sourdough a cold beer and you have one fine rustic dinner.